Who can you trust to provide your driving lessons or Trailer Towing tuition? Welcome to ADS Driving School! Learning to drive should be an exciting and fun experience, however, for many it can be a daunting prospect. By learning to drive with ADS Driving School you will benefit from our extensive experience which allows us to create a driving course built around you. This will quickly put you at ease and build your confidence. You will find yourself learning and developing skills with each lesson and so can reach or exceed test standard in fewer hours saving you both time AND money! Call today and find out how we can help you on the road to your driving licence. Whether a small trailer or a luxury yacht, towing any kind of trailer requires some additional knowledge and skills. There are also different rules and some additional legal requirements that have to be considered before you are legally qualified to tow. 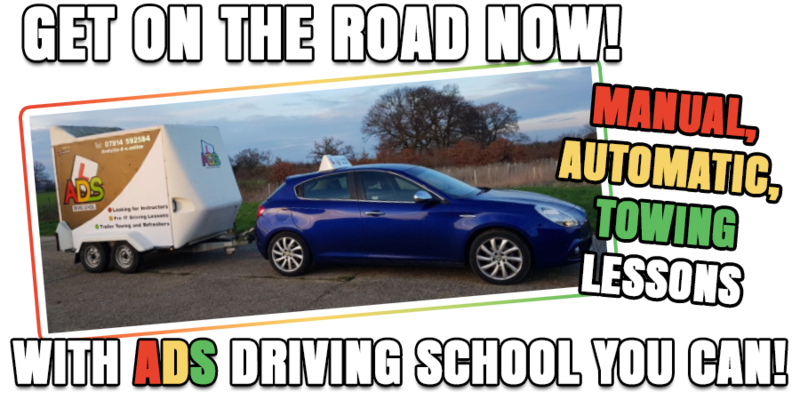 ADS Driving School offer specialist B+E trailer towing courses that will ensure you are not only legal, but will give you the confidence to tow whether a trailer, horse box, caravan or boat. We look forward to speak with you soon.